Spending Christmas in the Aloha State? If so, enjoy the season by attending one of the many Christmas parades in Hawaii. Delve into Christmas by watching beautifully decorated trees and floats march to the tune of Christmas carols. Sip cocoa with your friends and family. Listen to the bells jingle as the streets become alive with festive lights and songs. Each of the Hawaiian Islands offers Christmas tree lighting ceremonies and parades. So it’s almost certain you’ll be able to find a spectacular Yuletide procession nearby. There are countless Christmas parades worth attending on Oahu. The Honolulu Hale’s Electric Light Parade dazzles the streets with a lighting of over 20 trees. It also has a large procession of floats, Christmas decorations and musical performances. Children can take pictures with Santa, go on rides and sample tasty treats. The Honolulu City Lights Parade takes place at the Hawaiian Mission Houses Historic Site. While here, families can make candles, watch the parade and enjoy festive dishes. There is also the unique opportunity to join the Pedal Past the Lights Holiday Bike Ride. In this event, bike riders become the parade as they cycle through Christmas lights. Bike rentals and cocoa are free for all. And participants should dress up and adorn their bikes with jingle bells and Christmas cheer. This is probably the biggest of all Christmas parades in Hawaii. The Ala Wai Yacht Harbor hosts an Annual Hawaii Yacht Club Christmas Boat Parade. It’s one of the more unusual Christmas parades in Hawaii. In this event, you’ll see beautifully decorated boats with lights, Santa, elves, candy canes and other decorations. 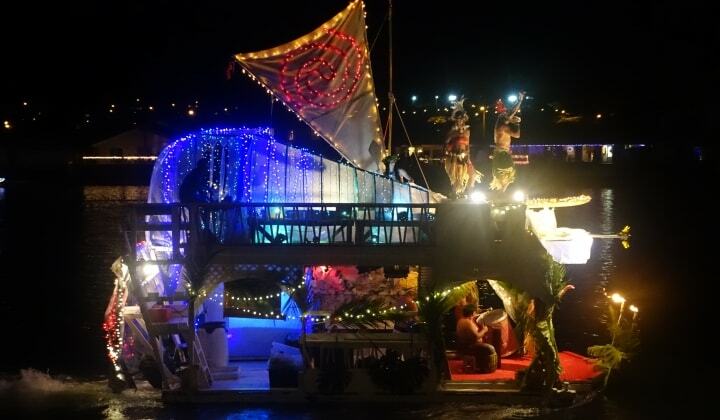 While The Festival of Lights Christmas Boat Parade in Hawaii Kai features illuminated boats off the marina. For processions on grass, families can also flock to local golf courses. At the Moanalua Golf Course you can enjoy a seasonal parade. While the Mililani Golf Course has a craft center, snow play zone and community parade. The Garden Isle is famous for its Lights on Rice Parade. It begins with the Kauai Festival of Lights and the Royal Palm tree lighting. This parade has nearly 2,000 performers, 60 units of floats and Christmas treats for the whole family. On the southwestern side of the island, the annual Waimea Christmas Lights Parade happens on the Saturday before Christmas. Here, people can admire gingerbread houses, Santa on sleigh, carolers and marching bands. After the parade, the public can join a free Waimea Christmas Party at the Hofgaard Park. There is live music and entertainment for friends and families to celebrate the holidays. The Waimea Christmas Twilight Parade and All-Day Celebration is a popular event. It’s been running for over 50 years in this cowboy town. Here, the magic of Christmas comes alive with the lighting of a Norfolk tree at Parker School. There is also entertainment from carolers and local storytellers on the same night as the parade. In Kailua-Kona, there is an annual Community Christmas Parade. For over 30 years, it has featured holiday floats, singers, marching bands and Santa Claus and his elves. The Kea’au Christmas Parade is another stunning procession of singers, performers and floats. For a day-time option, join the fun in Pahoa for a Christmas parade. Here, Santa hands out goodie bags to the children beginning at 9:30 am. The historic town of Lahaina has a Festival of Lights. You’ll find marching bands, decorative floats and a merry Santa Claus parading down Front Street. Families can also enjoy the annual lighting of the Banyan Tree. You’ll see thousands of glittering lights make the green branches twinkle. The Lahaina Cannery Mall also has a festival of trees. While the Old-Fashioned Holiday Celebration, also in Lahaina, has entertainment, crafts, live music and events for all ages. Even the quiet island of Molokai has their own ornate Christmas Parade of Lights. It feature floats and marching units unique to the island. There are contests for the most beautiful Christmas tree, the best dessert and prettiest ornament. If you are spending Christmas on Molokai, you will not want to miss this joyful holiday parade.